The Northfleet Hope Berth was built in 1978 and was the first purpose-built container terminal to be established in the UK. The terminal was initially designed to handle the large volume of blown-air reefer containers common to the Australian and New Zealand trade, and was equipped to handle 1000-plus containers at sub-zero temperatures. Nowadays large modern ships with integral reefer plugs have replaced the older blown-air ships and the terminal has the capacity to handle up to 1400 40 ft. high cube containers. 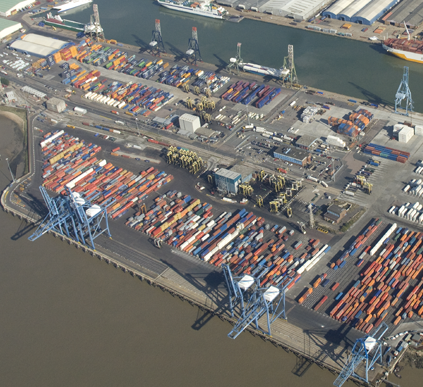 London Container Terminal is now firmly established as a leading purpose-built container terminal. Operations have increased in size in terms of volume, square footage and scale of activities, enabling it to compete successfully in a highly competitive market place and remain the first choice for some of the world’s leading container lines.